Tamil National Alliance (TNA) delegation met the president of Asia Development Bank (ADB), Mr. Tadao Chino, on Sunday and highlighted the context and the developments in the country that are detrimental to the equitable distribution of tsunami relief. The TNA, which has 22 of the 31 parliamentary seats from the northeast, told the president of ADB that the present activities of the government did not represent the democratic will of the people of the northeast and urged the ADB president to ensure that international aid was equitably distributed. "Hundreds of thousands of people made refugees by the war had not been resettled and rehabilitated despite the three year long ceasefire. These same people are now struck by the tsunami disaster," TNA told the ADB president. "Those most victimized were from the fishing community whose occupational freedom was severely restricted during the period of the conflict and even during the period of the ceasefire." 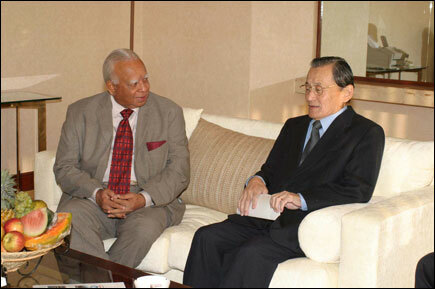 The delegation told Mr. Chino that the northeast had the longest coastline and 2/3rds of the human casualties and destruction to property was in the northeast, and that it was fundamentally important to ensure that the distribution of international aid was commensurate with the damage caused in different areas. "Based upon our past experiences we have every reason to be skeptical, and we would request the international community, in particular, institutions such as the ADB, to ensure that international aid was equitably distributed," TNA has told the ADB president. "There was an increasing tendency on the part of the government to centralize all activities pertaining to relief, resettlement, reconstruction and development, and there was hardly any local participation in the processes related to decision-making and implementation." "The Tamils Rehabilitation Organization (TRO) and the LTTE have during the period of the conflict, and from the time the tsunami disaster occurred, actively engaged in working amongst the people and providing required relief. Over a period of time they have evolved mechanisms to cope with such situations. There is an imperative need to actively involve the LTTE and the TRO in resettlement, reconstruction and development activities related to the tsunami disaster. The failure to do so would be tantamount to a refusal to come to grips with reality.‰ TNA warned the bank president. "The LTTE's active involvement in all activities related to the tsunami disaster would immensely strengthen the peace process, and we would urge the international community to ensure that such a mechanism is structured in the northeast." The TNA also told the ADB president that decisions taken at a centralized level were not conflict sensitive. As a case in point, TNAquoted the deployment of Sri Lankan armed forces to run the welfare centres housing Tamil people. TNA told the visiting president that this is a clear demonstration of the insensitivity shown to the feelings of the Tamil people. TNA pointed out that the armed forces are almost 100% Sinhalese and the Tamil people have had horrendous experience at the hands of these same armed forces in the past 20 years. TNA also pointed out to the ADB president the obstructive stance of the main alliance partner of the Sri Lankan government, the JVP. TNA said that this was amply demonstrated by the statement made on behalf of the JVP at the meeting of party leaders with UN Secretary General on the 9th of January. According to TNA sources, Mr. Chino assured the TNA delegation that the ADB would be very mindful to ensure that aid granted by the ADB is equitably distributed without any room for complaint. Mr China also said that the ADB, which was committed to ensuring a better life for all people in the Asia Pacific region, will ensure that all people affected by the tsunami disaster are helped to rebuild their lives. He added that ADB was also interested in long-term development in the affected areas. Mr. Pio, the country director of the ADB for Sri Lanka, assured the TNA delegation of the fullest cooperation in all activities. The meeting was held in a very friendly and cordial atmosphere, TNA sources said, adding that the TNA was very satisfied with the meeting. The TNA delegation comprised Mr. R. Sampanthan M.P., Parliamentary Group Leader, Mr. Joseph Pararajasingham M.P. and Mr. Gajendrakumar Ponnambalam M.P. The ADB president was accompanied by Mr. Y. Kanzaki, chief advisor to the president, Mr. K. Senga, director general for south asian department of ADB and Mr. Alessandro Pio, country director for Sri Lanka.